SOLANA BEACH — As a recreational organization the Solana Beach Soccer Club avoids putting an emphasis on the final score of the games. 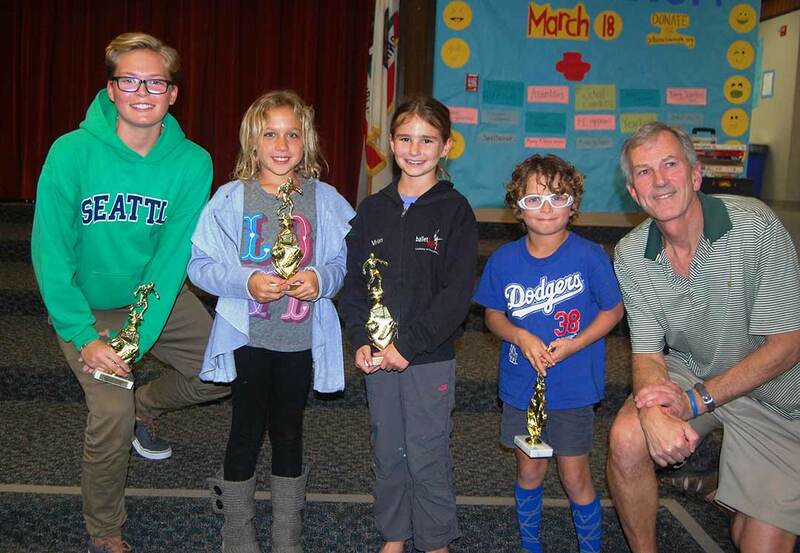 “That doesn’t mean we don’t want to win,” Jeff Lyle, club president, said during the annual board of directors meeting March 1 at Solana Vista Elementary School. “But how you play in terms of sportsmanship can affect the end result. “And the character part is something that will stay with these athletes forever,” he added. With that introduction five young players were honored with the Peter Schmid Sportsmanship Award, established by Anthony and Amanda Schmid in honor of their son to continue to foster his love of soccer following his untimely death. Coaches are encouraged to nominate players who demonstrate good sportsmanship. Recipients are chosen by the board of directors for their citizenship, helpfulness, attitude and loyalty on and off the field. Awards for the 2015 season went to Olivia Grimstad, Vivian Kowieski, Juliet Quinney, Milo Rikos and Sophie Williams. “We had a team full of amazing girls but these two young ladies stood out week after week, practice after practice, game after game,” Coach Lisa Wexler said about Sophie and Juliet. They would gather equipment without being asked to do so, were always on time and ready to go and showed “100 percent respect for themselves, their teammates and their coaches,” added Wexler, who coached the under-16 team that went on to win the league championship for their division. Coach Randy Jacobs said Olivia always had a smile on her face, a terrific attitude and a willingness to play any position. David Stapleton, who coached the under-10 girls with Jacobs, said Vivian demonstrated all the qualities of the Peter Schmid Sportsmanship Award. “She had spirit, teamwork, selflessness and a great attitude,” he said. “There was never a complaint, and when we were down as a team she could pick up the mood for all of us. “Regardless of the score, his teammates’ abilities, the temperature, Milo is always 100 percent focused on the fun of the game,” she said. During one of the few winning games her team had last season, Milo was concerned that his opponents might be feeling bad and asked the coach what they could do to help. A surprised and honored Lyle received the second annual Scott Billington Memorial Award, which was created to pay tribute to the former president, who passed away last year at age 55 after a long battle with cancer. The award recipient is chosen for leadership, selfless enthusiasm and contributions to the club that honors Billington’s spirit.